Phil’s 35 years in the industry help the rest of the crew when ever there is a glitch along the line. 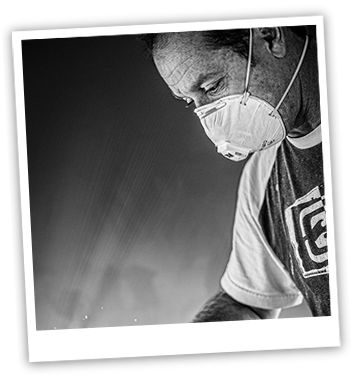 A total all rounder, Phil’s precision in his shaping is carried right through to his sanding. He’s the main ‘CNC cutting machine man’ in the factory, Phil’s job is to make sure that all the CNC cut files are perfect and come out exactly as the shaper intended. Phil also works with other surfboard factories to ensure their cut files being cut at Seabase are replicated to the highest standard. Its no easy task, but Phil takes this in his stride: the maintenance and prep work needed to keep the machine running smoothly is not for the faint hearted. Phil’s accuracy and perceptiveness add a dimension to the Seabase factory that most factories could only dream of. Phil lets his work do the talking, and the quality of his shapes can be seen just by watching people surf his boards. The perfectionist that he is, Phil’s work, whether it’s a machine file, a surfboard or even wind turbine blades (a recent project at Seabase), the product always comes out as intended ensuring that the 100% Quality Seal is nothing but a formality. Phil’s experience in the surfbaord industry has helped everyone in the factory at some point – from shaping through to finishing – Phil is the ‘Freddie Flintoff’ of the Seabase crew!